Sporting a full circle display and unique rotating bezel, the Gear S2 offers unprecedented convenience and style in a powerful wearable device. That rotating bezel serves as the main control for the UX—along with Home and Back buttons on the side—giving you a new, fun and intuitive way of accessing the Gear S2, without your fingers getting in the way of the screen. Now you can control your smartwatch with just a simple turn, rotating the bezel to choose apps, check messages and customize the Gear S2. Just 11.4 millimeters thin, with a crystal-clear 1.2-inch Super AMOLED display, the Gear S2 looks stylish and elegant, in a form that’s just right for you. And with hundreds of watch faces available for downloading and dozens of fashionable watch bands, you can customize their Gear S2 so it matches your unique style. The Gear S2 comes in two options, the Gear S2 and Gear S2 classic, giving you more choices to find the style that’s right for you. The classic has a timeless design, with a black finish and matching leather band, while the Gear S2 is great for people on the go, looking for a more minimal and modern style. With 4GB of memory and a dual core 1GHz processor, the Gear S2 has the power to do more, which helps you do more. 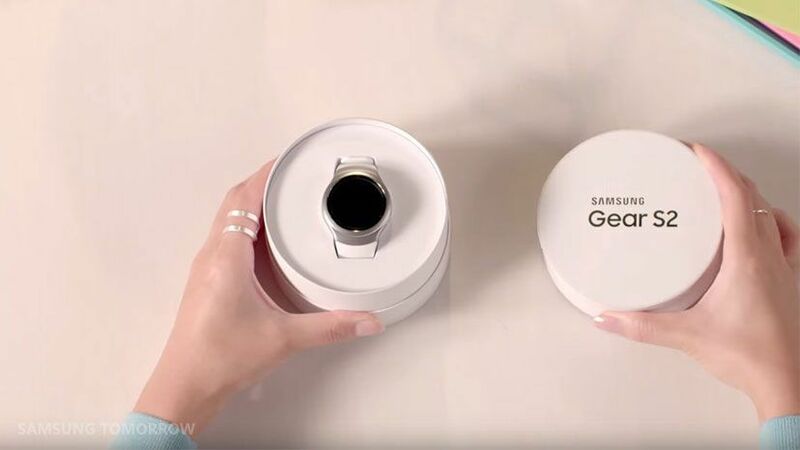 All Gear S2s come with Wi-Fi and Bluetooth connectivity, plus a 3G option is also available so the Gear S2 can be used without being tethered to a smartphone. They also have NFC technology, giving them the capability of handling mobile payments and smart keys for the home and car. The Gear S2 is also compatible with Android phones running on Android 4.4 or higher, with at least 1.5 GB of RAM. You can find all compatible Android smartphones here.